Podcast: "Saving the Ecosystem with Wild Backyards (and other awesome endeavors!)" Be reckoned but with herbs and flowers! ...We can stop most [species reductions] by redesigning anthropogenic habitats so that their use is compatible with use by a broad array of other species. That is reconciliation ecology. Many pilot projects...are demonstrating that it can be done. 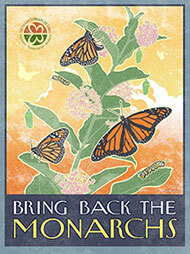 Book Review: "Attracting Native Pollinators"
More Milkweed = More Monarchs! Ecological Gardening by Adrian Ayres Fisher is licensed under a Creative Commons Attribution-NonCommercial-NoDerivs 3.0 Unported License. Food Democracy Now! is a Midwest-based "grassroots community dedicated to building a sustainable food system that protects our natural environment, sustains farmers and nourishes families."